Puma BMW Williams Windstopper Jacket - Men's Cut - GoreTex. Dark blue original Gore Tex wind stopper. Raglan sleeves with white decorative seams and raised race car nose appliques on the arms. 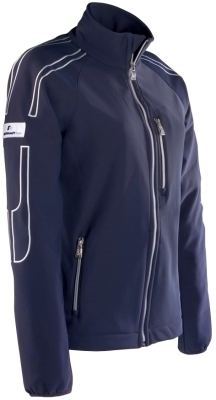 Stand collar, silver-coloured zip and three zipped vent pockets on the front. BMW Williams Team logo on the right sleeve, Puma logo on the left sleeve. Original Gore Tex; 57% Polyester / 43% Polyamide. Available in size S, L, XL & XXL.